• Cenotes – One of the biggest draws for divers to Riviera Maya are the cenotes. There are literally thousands of cenotes (natural caves that are filled with fresh water) in Mexico’s Riviera Maya. When there are over 6,000 cenotes to be explored, it becomes hard to distinguish between the best and the good. Some of the best cenotes to explore on your scuba diving excursion include Cenote Ik-Kil, Cenote Angelita, Cenote Manatee, and Cenote Tak Be Ha to name a few. • Boat Dives – Boat dive are a great option to visit the beautiful and healthy coral reefs of the Riviera Maya. Boat diving is by far the most convenient form of diving, and most of the Riviera's best scuba diving sites are accessible only by boat. During your boat diving trip, get a chance to discover colorful ocean fish and heavy populations of sea turtles. Additional sea life that you can expect to see in the Riviera waters include manta rays, squids, and other tropical fish species. • Swimming with Whale/Bull Sharks – For many divers, the ultimate scuba diving excursion in the Riviera Maya is not complete without an adventurous swimming experience with the gentle and slow-moving whale sharks or the exciting bull sharks that populate the area during certain times of the year. This once-in-a-lifetime experience of swimming with the largest known fish species in the water is unforgettable! 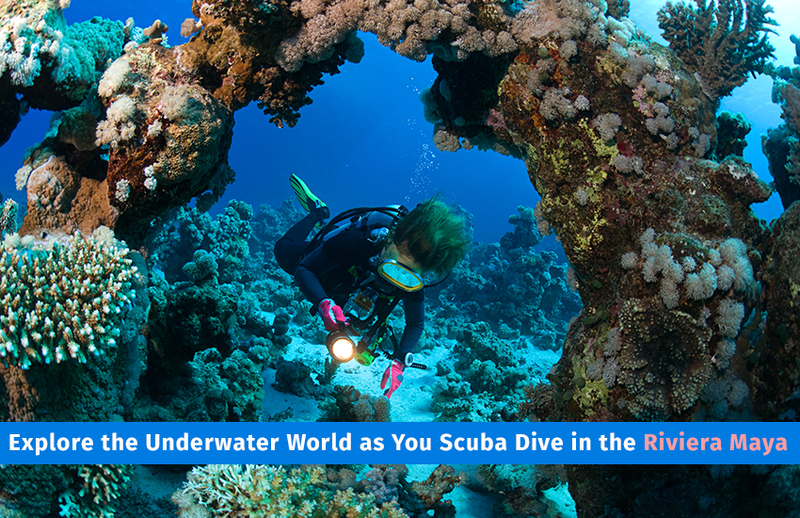 While diving in the Riviera Maya, you can expect to see amazing sea life. The Riviera Maya is also a nesting ground for endangered sea turtles. You may get a chance to swim with the fastest fish in the world – the sailfish. Adventure enthusiasts will also get the opportunity to dive with sharks. Bull sharks are abundant in the area through the months of November to March. The wildlife assortment doesn’t end there. Rays, octopi, starfish, and squid can also be seen along with the nearly endless variety of colorful common fish. 1. Hire a Scuba Charter : The best way to enjoy your next scuba vacation is to hire a scuba dive charter. Dive yacht charters have an experienced captain and dive master aboard who are knowledgeable about the locations and make sure that you have the best scuba diving experience ever. 2. Be Familiar with Your Equipment – When you hire a scuba charter, they have a knowledgeable dive master on board, but it is always important to obtain certification prior to coming on board. For more personalized and cherishable experience, the experienced staff will guide you at every location. Do you need more reasons to consider Riviera Maya for your next vacation? Your Riviera Maya scuba diving excursion will become the main event on your vacation if you take into consideration the aforesaid mentioned points. Get ready! You are about to embark on one of the most exciting and spectacular adventures of your life!